2. The existence of weapons of mass destruction in Iraq was presented with a certainty that was not justified. It was never ‘beyond doubt’ that the weapons existed. None have been found in the subsequent 13 years. In reality: it was completely clear, beyond any reasonable doubt, that the whole ‘weapons of mass destruction’ issue was a propaganda fabrication; a way of suggesting a ‘threat’ where none existed. Iraq only ever possessed battlefield biological and chemical weapons that were of no conceivable threat to the West. Iraq didn’t even use them when the West attacked the country in 1991. Not only that, but UN weapons inspectors had overseen the near-complete destruction of even these tinpot devices between 1991-1998; only ‘sludge’ remained: a known fact. Iraq was of no more threat to the West in 2002-2003 than Thailand or Iceland; that is all that needs to be said. Almost everything else is superfluous: cynical propaganda which was, and is, manipulated by violent Western leaderships that think nothing of smashing other countries to bits for whatever reason they declare ‘necessary’. In reality: The Americans decided to exploit the dead of September 11 to wage war in the name of power and profit. Blair decided to take part in the crime, come what may, from the start. His whole intention was to make that possible, to trap Iraq into war and to use the UN to apply a veneer of legality to the monstrous crime. One million people paid with their lives, and a whole country was destroyed in the process. Bush at least had an ‘excuse’; he was, after all, a hard-right president operating out of a notoriously venal, violent and corrupt Republican ‘party’. (As Noam Chomsky has noted, it is wrong to consider it a legitimate party. It is merely a collection of greedy vested interests, qualifying it as a candidate for ‘for the most dangerous organization in human history’.) Blair, on the other hand, was prime minister on behalf of a supposedly left-leaning Labour party rooted in supposedly genuine ethical values. His rejection of democracy in the name of war was the perfect culmination of his coup transforming Labour into another power-serving Tory party. In reality: Bush and Blair sought to exploit the good name of the UN to provide a cover for their crime. The intention was to use the appearance of diplomacy as propaganda justifying war. If Saddam could be trapped into appearing intransigent in the face of UN resolutions, so much the better for war. Diplomacy was only ever perceived as a means to achieve war, not peace. The whole ‘weapons of mass destruction’ fraud had been concocted by conspirators intent on war. Why would those same fraudsters attempt to work through the UN to achieve peace? That was the last outcome they wanted. Those words will haunt Blair to his grave.There is no doubt that his reputation is now in tatters, even in ‘mainstream’ circles. There have been follow-up calls for him to be punished by being thrown out of the Queen’s Privy Council, impeached and put on trial for misleading Parliament, and charged with war crimes. • Iraq’s people and infrastructure had already been crushed by a genocidal regime of UN sanctions, maintained with especially brutal vigour by Washington and London. • Iraq had already been essentially disarmed of any WMD, as revealed by relevant experts; notably Scott Ritter, former chief UNSCOM weapons inspector. 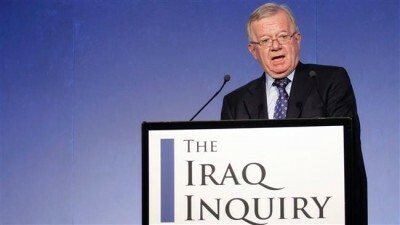 This was known well in advance of the war, as our media alerts from October 2002 make clear (‘Iraq and Arms Inspectors – The Big Lie’, Part 1 andPart 2). • In the immediate aftermath of 9-11, there was an agreed-upon Washington strategy to start wars against seven countries (Iraq, Syria, Lebanon, Libya, Somalia, Sudan and Iran) in five years, asrevealed by US General Wesley Clark. • The infamous ‘Downing Street Memo’ showed that the intelligence and facts were being ‘fixed around’ the pre-existing policy of invasion. Indeed, this was nothing less than a conspiracy to launch a war. You will struggle in vain to find ‘mainstream’ commentators linking any of this to Blair’s ‘I’m with you, whatever’ pledge to Bush. • The West’s desire to control oil resources was a key motivating factor for war. • The role of corporations and financial interests in driving government policy; in particular, the profits demanded by the ‘defence’ industry and arms manufacturers. The evidence suggests we have no need for a mea culpa. We did our job well. Today, the body of media evidence that we have accumulated shows precisely the opposite. In particular, the bulk of BBC output on Iraq can be characterised by one word: ‘Newspeak’. In 2003, a Cardiff University report found that the BBC ‘displayed the most « pro-war » agenda of any broadcaster’ on the Iraq invasion. Over the three weeks of the initial conflict, 11% of the sources quoted by the BBC were of coalition government or military origin, the highest proportion of all the main television broadcasters. The BBC was less likely than Sky, ITV or Channel 4 News to use independent sources, who also tended to be the most sceptical. The BBC also placed least emphasis on Iraqi casualties, which were mentioned in 22% of its stories about the Iraqi people, and it was least likely to report on Iraqi opposition to the invasion. These include all presenters, correspondents, editors, output editors and « anyone who can be considered a ‘gatekeeper’ of our output ». BBC managers have fallen over themselves to grovel to the government in the aftermath of the Hutton whitewash… When will their bosses apologise for conspiring to keep the anti-war movement off the screens? Not any time soon. We now know that the BBC and other British media were used by MI6, the secret intelligence service. In what was called « Operation Mass Appeal », MI6 agents planted stories about Saddam Hussein’s weapons of mass destruction – such as weapons hidden in his palaces and in secret underground bunkers. All these stories were fake. Pilger’s documentary on the propaganda role played by the corporate media, The War You Don’t See, is a must-watch. Snow did not respond when he was asked on Twitter a few days ago by one of our readers whether the Channel 4 News presenter ‘felt chastened’ on being reminded of this. In 2006, we noted that ’embedded’ BBC reporter Paul Wood had asserted that US and British troops had come to Iraq to ‘bring democracy and human rights’. When we challenged Helen Boaden, then head of BBC News, to explain this propagandistic reporting, she sent us six pages of quotes by Bush and Blair as supposed proof of noble intent. The notion that ‘we’ are the ‘good guys’ is fully embedded in the mindsets of senior media professionals. When Boaden grew exasperated with Media Lens challenges about the BBC’s systematically biased reporting on Iraq, she changed her email address and joked about it to an audience of media professionals. nearly 100 percent of the Labour MPs who have moved to oust Jeremy Corbyn voted against an investigation into the Iraq war. Amongst the Labour MPs who had voted in 2003 on the Iraq war, an overwhelming majority who voted against Corbyn were in favour of the military invasion of the country, which paved the way for an escalation of sectarian strife, and ultimately the rise of the Islamic State (IS). More generally, well over half of the Labour MPs against Corbyn are supportive of British military interventions abroad. Cast your mind back to April 9, 2003. US troops had just reached central Baghdad. Recall the footageof Saddam’s statue being pulled down in Firdos Square in what is now known to have been a staged public relations exercise to create a ‘propaganda moment’. The US army even admitted as much later. Frankly, Huw, the main mood [in Downing Street] is unbridled relief. I’ve been watching ministers wander around with smiles like split watermelons. Well, I think this does one thing. It draws a line under what had been, before this war, a period of… well, a faint air of pointlessness, almost, was hanging over Downing Street. There were all these slightly tawdry arguments and scandals. That is now history. Mr Blair is well aware that all his critics out there in the party and beyond aren’t going to thank him – because they’re only human – for being right when they’ve been wrong. And he knows that there might be trouble ahead, as I’ve said. But I think this is a very, very important moment for him. It gives him a new freedom and a new self-confidence. He confronted many critics. I don’t think anybody after this is going to be able to say of Tony Blair that he’s somebody who is driven by the drift of public opinion, or focus groups, or opinion polls. He took all of those on. He said that they would be able to take Baghdad without a bloodbath, and that in the end the Iraqis would be celebrating. And on both of those points he has been proved conclusively right. And it would be entirely ungracious, even for his critics, not to acknowledge that tonight he stands as a larger man and a stronger prime minister as a result. This was BBC ‘impartiality’ in action. Although reading those words today and, especially, watching the clip is jaw-dropping, such propagandist comments about Blair and Iraq were not unusual then on the BBC, and elsewhere in the national news media. The next time BBC News praises itself as ‘the best news organisation in the world’, just think of that clip. it was rubbish but it came after weeks when I’d been predicting Baghdad bloodbath – the Iraqi army gave up. Gave up? Or were slaughtered under ‘Shock and awe’? As for the gushing praise for Blair, Marr was silent. ‘The build-up to the invasion of Iraq is the point in my career when I have most regretted not pushing harder and not asking more questions. Robinson had been ITV News political editor from 2002-2005. We asked Marr whether he shared his colleague’s regrets. Again, the response was silence. It was my job to report what those in power were doing or thinking . . . That is all someone in my sort of job can do. That’d make an excellent epitaph on the tombstone of modern establishment journalism. Elsewhere on our bulletins we did report those who questioned the truth of what we were being told. There is scant evidence of that being the case. Those with the expertise, not just to question, but to demolish, Bush and Blair’s ludicrous excuses for war were rarely seen. Now, more than ever before, I will pause before relaying what those in power say. Now, more than ever, I will try to examine the contradictory case. To little or no avail, as we have seen in the intervening years. Those with the expertise, not just to question, but to demolish, Bush and Blair’s ludicrous excuses for war were nowhere to be seen. The Cabinet in March 2003 knew a great deal about the conspiracy to attack Iraq. Jack Straw, later appointed « justice secretary », suppressed the relevant Cabinet minutes in defiance of an order by the Information Commissioner to release them. Also sitting in the Blair Cabinet were Geoff Hoon, the Defence Secretary; Gordon Brown, the Chancellor of the Exchequer who released the finances to fund the war; and John Prescott, the Deputy Prime Minister. Last Sunday, Prescott tried to dodge his part in the supreme international crime by claiming that he was ‘forced’ to sign up to what he now concedes was an illegal war by the devious, wily Blair. Prescott, we are to believe, was duped by Blair’s mendacious charm, even while millions of people saw through the lies and went out to march in protest on British streets. Thirteen years after the war, the Middle East is in flames, Britain is a more dangerous place than it was and the threat of terrorism across the region is greater. Chilcot makes clear that this was a catastrophe both foretold and avoidable. Chilcot would not have happened without the anti-war movement and we should not see it as the end. ‘There have to be consequences for those responsible for this terrible war.